Welcome to The Convenience Company where we specialise in keeping your guests completely satisfied by providing affordable luxury portable toilets for corporate events, private functions, festivals and outdoor concerts. We have developed our range of portable toilet units to be more luxurious than your average portable loo, meaning guests are always pleasantly surprised at the incredible toilet facilities that are present at every event to which we supply. With over 20 years experience in the portable toilet hire industry we have become experts in supplying our clients with toilets for every kind of event involving any number of guests. We have a unique range of tipi themed toilets. The exterior of these units is colour matched to tipi canvas, making our tipi toilet units the perfect partner for your tipi event. The interior has also been designed to tie in with a tipi event theme, with bespoke wooden vanity units, stone sinks, and some fabulous wall sized woodland images too. 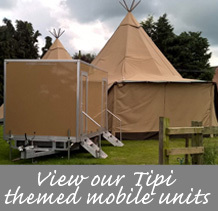 Please take a moment to look at our Tipi themed range of Mobile toilet units. There is no need for water and drainage facilities as these are fully incorporated into each unit, and due to our regional branches our team will always be able to get to wherever you are and set up each mobile facility under your location preferences. We offer portable toilet solutions for all kinds of budgetary requirements and event sizes, so if you require further information or to get a quote then please feel free to call the number provided.